Mortal Kombat X is the Xth game in the popular series about punching. But! Not all is punching. Sometimes it's watching, because a story-bit is happening. Here is a trailer for these non-punching sections. Fans of the series will recognise returning characters like Chilly Scar, Mask Hair and That Guy. "Taking place 25 years after the events of Mortal Kombat™ (2011)," writes a press release, non-ironically using a ™ in case we had forgotten that Mortal Kombat is a popular, established and legally protected series of punch-'em-ups, "the new generation of characters will discover that Outworld is not the only threat they face. Fans will get a first look at the newest fighters to join Cassie Cage, including Jacqueline Briggs, daughter of Jax, Takashi Takeda, son of Kenshi and Kung Jin, descendant of Kung Lao." 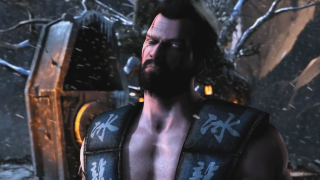 Mortal Kombat X is due out on April 14.